Navigating your Spam Filter "Quarantine"
We've recently started upgrading our Spam filtering platform, so it's time to post some updated instructions. These days Spam messages account for 80%-90% of all email sent worldwide, generating a lot of clutter and in some cases, security threats. We strongly advise filtering mail before it gets to your mail server, and many of our clients have signed up for Spam filtering services with us. The gist of this service is that all mail is filtered in the cloud before it gets to your mail server (either in the cloud or at your office). This way, the spam is kept off your network, and cleaned up in a central location before getting your PC, iPad, smart phone... all the devices you may use to read mail. Typically we set up the filter to send a summary report every day, typically scheduled for 8am (this can be scheduled for any time, and can be sent more than once a day). 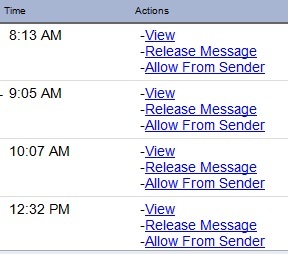 You'll get an email summary in your inbox with a subject: "Messages quarantined since (previous day)". In some cases, you'll see a "false positive" which is a message that is flagged as spam, but actually something you want delivered. After a while, your filter will be "trained" to know what you want and what you don't want based on your preferences, but after an upgrade its important to check regularly at least at first. When you open this message, you'll see a summary of the total number of messages quarantined and a list of all the messages including a "subject", the "Address" of where the email is coming from, a time stamp of when the message arrived, and some "Actions" you can take. Scan through the list to see if there are an messages you want to have delivered. You have several allowed actions. "View" lets you look at the message in more detail without actually sending it to your mail server. This is a good option when you're not sure what the messages is. "Release Message" lets you release it to your inbox. Finally, "Allow from Sender" lets you release it to your mailbox and put the sender on your "safe list". This means that not only are you releasing the current message, but any future messages will automatically be allowed through. This helps "train" the software so you'll get fewer and fewer "false positives" over time. At the top of the Quarantine Summary email is a link to "Enter your Quarantine". This is how you can get to your quarantine any time. For example, you may be expecting an important email that didn't arrive and you want to check your spam filter in real time to see if there's anything important there. If you don't know your password, don't worry. Just go to the login page and select "Forgot Password" to reset it. Many people try their email password or Windows password and this is a separate password. After you log in, you'll be able to see your up to date quarantine (so you don't have to wait until the next day's summary), and you can also proactively add "safe senders". Under "User Options" you'll see "Allow List" and "Block List" where you can add addresses you want mail from or don't want mail from. Also, you'll see an option to set your password to something you can remember. We strongly advise using only ONE spam filter. In Outlook, turn off your "Junk" filter as it is much more efficient to only check one location to manage spam. If you're not running Exchange mail, the Outlook "Junk" settings don't help for spam on your smart phone or tablet, so this is why we recommend filtering in the cloud before the messages get to your mail server. Getting your mail organized will save you time so take a few moments to acquaint yourselft to the settings.